Load DVDs, DVD Folders and iso images. Choose export device or video format. Choose subtitle,audio for your video. 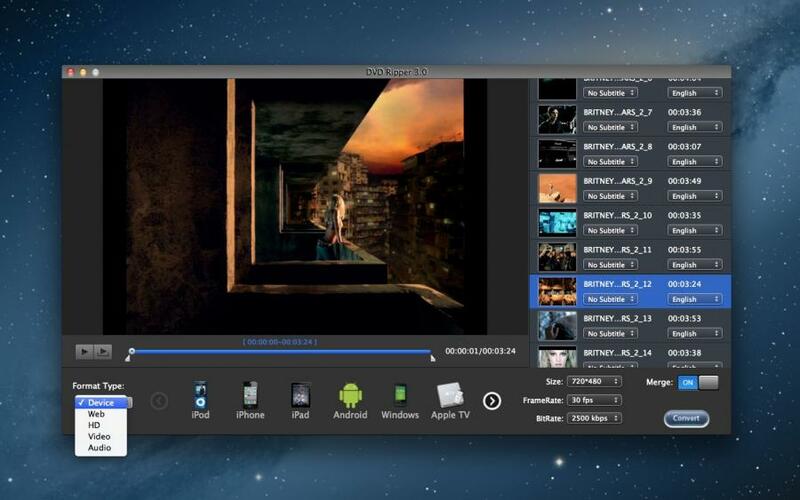 Export videos to any QuickTime format available on your Mac. Fast conversion speed and excellent output quality. DVD Ripper 3 is easy to convert the dvd file to video formats, only need load your dvd file then choose video format. 1. Import you DVD or DVD Folders convert into all popular video and audio formats . 2. Support DVD, DVD folder, VIDEO_TS, DVD MEDIA, ISO import. 3. Convert to video (MOV, MP4, AVI, ASF, WMV, M4V, MPEG-1(mpg), MPEG-2(mpg), DV, MKV, TS, FLV, 3GP, 3G2, etc). 4. Enjoy DVD movies easily on all popular devices: iPod, iPhone, iPad, Apple TV, PSP and other mobile devices. Set video and audio parameters: frame rate, bit rate, video size, audio sample rate, etc. Note: If you have some problems,Please send an email to chaoyuemesoft@126.com . I will solve these issues as quickly as possible.